Sad news! Joyce Eide, age 87, passed away on December 13, 2017 after a long illness. She was born on September 21, 1930. Rest in peace, my good friend. She leaves an afterglow of smiles for us. Let the memory of Joyce be a happy one. This is a repost from 8/10/2014 introducing Joyce and her art work . 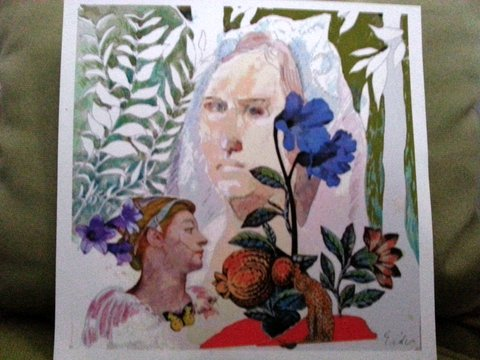 In the late 1970s, I met artist Joyce Eide in the town of Lindos, located in the south-east of Rhodes Island. Lindos was famous for its white cubist houses packed tightly around winding cobblestone streets, and for its community of artists. I loved Joyce’s art work and we continued contact while we both lived in Greece, and then in California. But we lost touch for many years. Luckily, I found Joyce on a Google search through Artexchange.com. Part of that write up is in this blog post. I’ve also posted a few of my favorite paintings, personal photos of the masks, colorful fused glass jewelry and a rich orange fused glass plate. Visit artexchange.com Joyce Eide to read her full resume and click on available art work at the end. A few months ago in June, 2014 while on a ten day vacation in Kirkland, WA, I called Joyce to rekindle our friendship. She was receptive to a visit and my son Jeff and I drove to her gallery home on Vashon Island, a short ferry boat ride from West Seattle. It seemed only yesterday that we had spent time together. That’s how it is with true lifelong friends! Granted we were both much older now, and Joyce, due to health problems, hasn’t been able to continue with her art work. Still the large gallery room was bright with natural light that showed every beautiful detail of her paintings, masks, ceramic pieces, fused glass jewelry and fused glass plates. It was a color burst of emotion and thought. And such a joy to spend time again with a dear friend! I live on a small island in a large historical building, a former general store and post office built in 1910. A remodel of this building has produced a studio and gallery, now christened “The Old Dockton Store Gallery” where current works of mine and local artists are on display. The primary force of my professional life has been exploring new pathways in communicating experience through a wide variety of art forms, including children’s books, posters, packages, record album covers, illustrations for national magazines, and animation film backgrounds. Reaction to my work has convinced me that spiritual longing, emotion and thought shaped and compressed into form evokes a universal response. My recent work in creating masks has the goal of creating symbols of the commonality of the human spirit, and the oneness of the human beings with the natural world. This entry was posted in Featured Friends, My Blog, My Entries and tagged artexchange, artist Joyce Eide, featured friend, fused glass art work, In Memory of Joyce, lifelong friend, Old Docton Store Gallery, paintings, Vashon Island. Bookmark the permalink. So glad you like it. Thank you for your Ghost Image inspiration. I wouldn’t have thought to include it on Joyce’s post without the prompt! I have lost track of Joyce Eide also. I knew her when she lived in La Jolla Ca. and was an occational member of a drawing group in our back yard. She left some of her drawings and work with me. I just came accross a group of sketches of hers and would like to renew to renew a friendship with her. My name is Melissa Smith Elliott . I still live in the same place. Please forward her our email at drmaxelliott@san.rr.com. I thank you for blog about Joyce!!! Dear Christine, a dear friend, artist Vivian Blackstone, is working on a showing of Joyce Eide’s work but has lost contact with her since her gallery on Vashon Island is no longer there. Would it be possible for you to connect us? Please give her my email if you would be so kind. 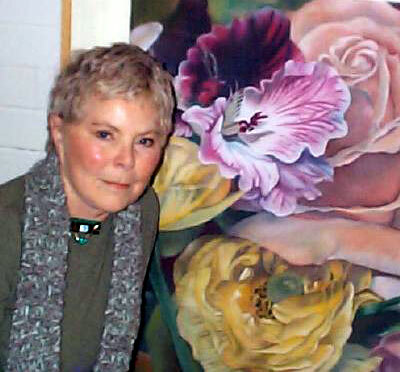 In memory of a good friend, artist Joyce Eide. Thank you so much, I wanted to reconnect with her and Shawn, I heard they sold the house on Vashon, and came to La Jolla/S D, but were not reconnecting with old friends. She was one of the most talented artist I knew, and have collected her art, since we met in 1963.Vivian Blackstone. So sorry to hear of your loss. I wish I had better words to say, Christine. Thank you for letting me know, Christine. I will pass the word on to my friend, Vivian. This is sad news, but I know Joyce lives on in her art. We are indeed fortunate when such special people grace our lives with theirs. I had such a friend, also an artist, Carol Gilbert Wagner. Alas, Carol died six months before I left America to begin my ex-pat life. When Carol passed, she had been planning a show. It didn’t take much convincing to rally some friends and make that show happen. It was a memorial show and Carol was there in each piece and all who loved her. Christine, this post is a real gem. I’m glad I stumbled upon it. What a lovely tribute to Joyce. Hugs on the wing. You’re kind to remember that, Christine. LOL, it’s true — If I wear all neutrals or especially black… I just don’t even feel well. (I used to like black for an occasional color, but it’s all I see around DC… Ugh… I call it “DC Drab!” They think “tan” qualifies as adding a pop of color… More hugs! Very interesting! Speaking from experience in DC and other places where people are, in a sense, walled off from Life, it strikes me that people do this whenever there’s a high degree of fear present. There may be other elements as well, but fear is high on the list, whether they realize it or not, and whether they admit it or not. I love art! May she RIP! I do Art Gowns, too! That’s the other link Timothy posted. It’s not normal art, but it’s unique. It’s what I can do, not just take pics of. Thank you so much for your visit!